Chinese battery and automobile producer BYD Co. is scrambling to make a last-minute design change to its all-electric battery car and is now aiming to make the car available to private buyers in California and possibly a few other "key U.S. states" by 2012 after test marketing the car in Southern California during the second half of this year, said company Chairman and founder Wang Chuanfu in an interview. The redesign of the car—called the e6—even before it is launched in the U.S. comes as a result of BYD's decision to improve the car's rear seating area and means the U.S. test marketing and launch of the electric car would be delayed, in the end, by about a year. The company was aiming to begin the test marketing in California during the second half of last year. The e6 debuted in China last March as taxis in Shenzhen. 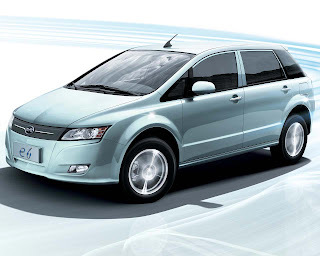 The BYD e6 is an AWD minivan, that strikes a remarkable resemblance to the honda odyssey, that comes standard with a huge 60 kWh battery pack (larger than the Tesla Roadster) giving it close to 300 miles range, and will sell in the United States for $35,000 before incentives.